I’m delighted to be exhibiting again at this year’s Holmfirth Artweek which begins on the on the 1 July 2018 in Holmfirth, West Yorkshire. The show has become a firm fixture on the annual events list and attract thousands of visitors from across the country raising thousands of pounds for Macmillan Cancer Care. ‘Sheep…’ and ‘The Valley…’ will both make their debut in the main exhibition whilst a number of new paintings will also be on show for the first time at Enjoy Art, Marsden where I will be a Fringe exhibitor. ‘Sheep…’ – acrylic on board – measures 16 x 14″ and has been beautifully framed by Delph Picture Framing with an off white frame and will be on sale for £450.00. You may need a bigger wall space for ‘The Valley…’ possibly the biggest painting I’ve completed at 138 x 87cm and again framed in off-white. The size of the painting gives a wonderful immersive quality to the landscape. ‘The Valley…’ will retail at £1200.00. Both paintings are inspired by poems and those who have read The Walk from Flowers by the Road may recognise one of the titles. I’m delighted to announce that my poetry collection titled, Flowers by the Road, has been chosen as the winning entry in the latest Templar Poetry Portfolio Awards. The collection will be published by Templar Poetry as a pamphlet in early 2017 and launched with a special reading at Keats House, London. Please keep a look out for more news and release dates. In other news the painting, Neighbour (pictured below) completes the series of paintings under the heading, Two Houses by the Road and all works are now available at the Millyard Gallery, Uppermill, Saddleworth. A selection of new paintings will be released during October featuring scenes from both the Colne and Calder Valleys. More details very soon. Greengates is the fourth in a series of recent paintings exploring a more fluid approach utilising both oil and acrylic. The starting point for Greengates was an unloved oil landscape partially sanded back which provided an almost abstract texture to work on. Atmosphere and composition was then created quickly utilising acrylic and ink and finally enhanced by oil. The painting was finished with satin varnish. The painting is framed and available for purchase at Enjoy Art Gallery based in Marsden. 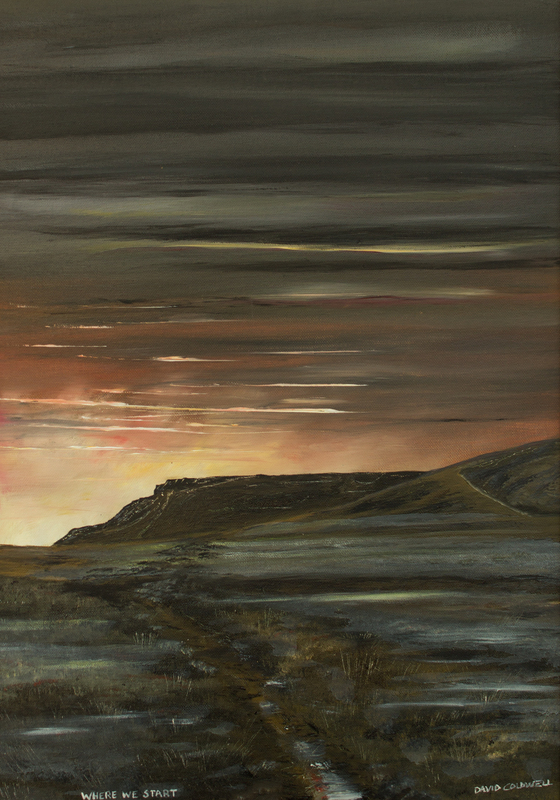 Other works in the series include: Pennine Sunset, Neighbour and Holiday Home all of which are currently available through my Artfinder shop. And finally, inspiration this month comes from The Lumineers who recently played an amazing sold out show at the very excellent Albert Hall in Manchester (not to be confused with the Royal version). A number of original paintings are now available on Artfinder. For a limited time each painting will be delivered with a special selection of free gifts (prints and cards – by me). Please follow this link – Artfinder – for more information. And to celebrate here’s the fabulous Richard Hawley. What’s not to like. The legends are celebrated in various ways: Marsden goes Cuckoo for a day in April (which is slowly becoming Cuckoo weekend), Golcar enjoys Golcar Lily Day in May (which is still just a day) and every two years in February Slaithwaite steals the show with the Moonraking Festival (which now lasts for a whole seven days). It’s now thirty years since the people of Slaithwaite first paraded the streets of their village with hand-made lanterns towards the canal where a paper moon was raked out to the delight of the waiting crowd. Each of the proceeding festivals have had a theme and to celebrate this landmark year the theme for 2015 is, coincidentally, ‘Landmarks’. In recent years competition to build the biggest and best lantern has become fierce and the themes have led to inspiring paper lights in the shape of Dr Who’s Tardis (time), a mouse and clock (nursery rhymes) and our very own star (which managed to hold its own against any number of themes until it finally disintegrated in a snow storm in 2013). This year the festival runs from the 15 – 21 February and includes lantern making, music, story-telling arts and crafts and culminates in the unique finale on the Saturday evening when thousands of people will line the streets of Slaithwaite with their lanterns to watch the moon raking. Don’t miss out – Slaithwaite Moonraking has quietly turned into one of the best local arts festivals and is great fun for all the family. To celebrate this year’s Landmark festival the painting, Where We Start which features Marsden and Slaithwaite’s very own famous landmark, Shooter’s Nab, is now available to purchase. The painting was completed in response to the poem, Tuesday Afternoon which was written specially for the now legendary Write Out Loud Poetry Jam at last year’s Marsden Jazz Festival. It was really heart warming to get so many requests for copies of the poem following my reading so in lieu of publication I’ve decided to make the poem available below. As a special treat – a handwritten version will accompany the painting when it is sold. In other arts and poetry news, a small selection of my work will feature in the Hand Made Trail as part of the Moonraking festival – this will be in the form of a pop up gallery created by the excellent Enjoy Art gallery from Marsden where a more permanent collection of my work is still available to view. The Art Finder shop is slowly coming to life – you can follow my exploits by pressing the big button on the left hand side of this post. In poetry news, I’m very excited to be reading alongside Tom Clearly and Steve Anderson at the Square Chapel, Halifax on Thursday 12 February. Wordplay has become a popular monthly event that also includes five open mic spots. The nights are hosted by the fabulous Keith Hutson so please come along if you are in the area. From the halls this week we celebrate local duo O’Hooley and Tidow who launched their amazing album, The Hum last year in Marsden and have just been nominated for Best Duo in this year’s Radio 2 Folk Awards. The duo will also play a sold out show at The Watershed, Slaithwaite on Thursday 19 February as part of the Moonraking festival. the dry stone walls and farm gates. of stars and clouds and sky. follow a path and let the village drift from sight. footsteps and the birds, still unknown, that cry out. the snow line. Up close it looks like teeth. of radio signals and strange night-sky activity but says nothing. and search the wind for the hum of the village. mud from their nails. The red flags begin to snap in the wind. or the Earth turning, skipping a beat. or something else, something beyond the wind. 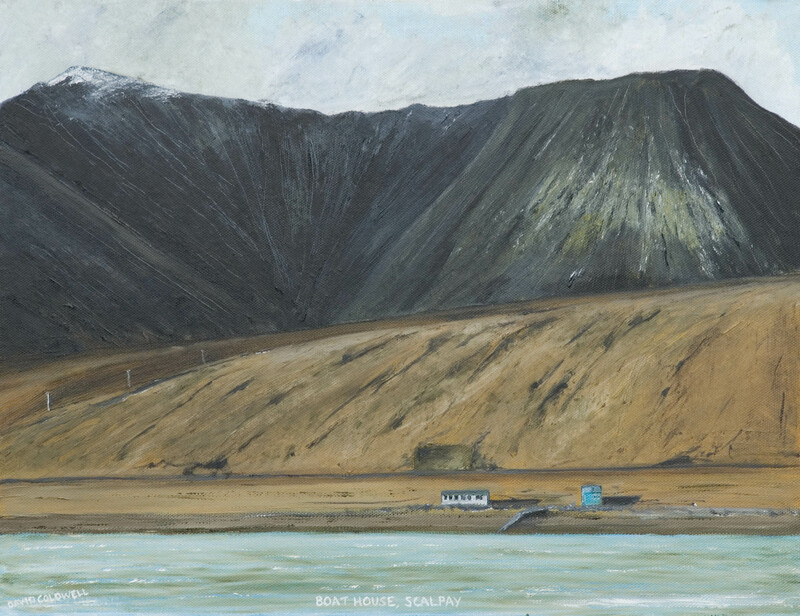 To help celebrate the launch of my Artfinder shop I’ve decided to release the original painting, Boat House, Scalpay from my private collection. This is the first time that this painting has been available to purchase. Scalpay is a small island just across the water from the Isle of Skye off the west coast of Scotland. 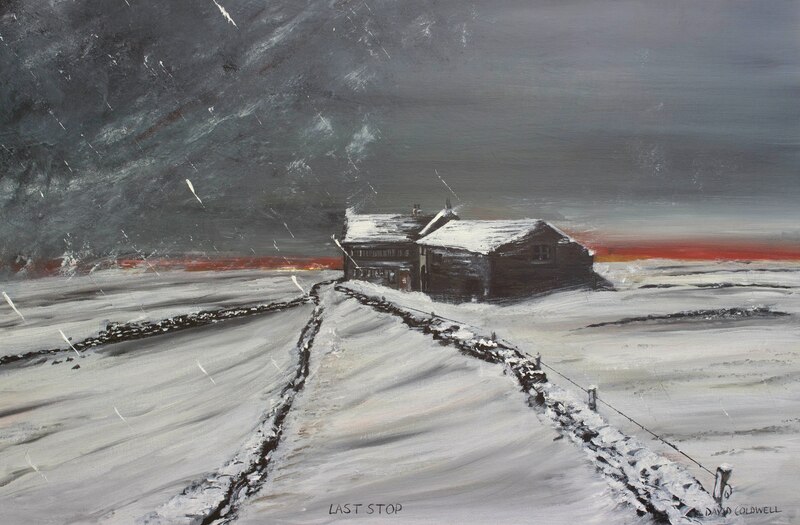 The painting was completed following an autumn break towards the end of 2009 when the first snows where just beginning to appear on the mountain tops. The work is framed in solid oak and ready to hang. Keen eyed observers visiting the shop might just spot the picture on the wall of my studio in the photograph on my storefront.